This beret is made especially to fit with the style of my lace shawls... I've crocheted several models in different shapes until I felt satisfied with the look of this flowery crochet beret - and here it is. A stylish and charming, a wonderful soft and light weight beret that flatters every woman! Solid and substantial, the sterling silver woodgrain ring is designed with a slight taper and carefully rounded edges to fit comfortably enough for everyday wear. 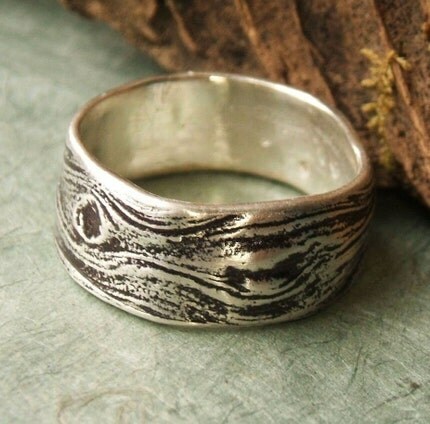 Made from an impression from a peeled hickory branch and oxidized to enhance the fine detains of the grain. 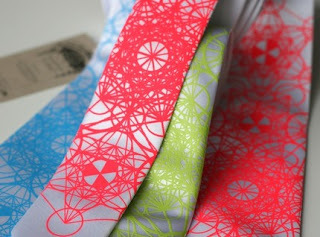 Haute Math (or High Math). Looking back to sacred geometry, this original illustration is a repeated and overlapped pattern, based on the archetypal image of "Metatron's Cube" a.k.a. "The Flower of Life." Shown in both skinny and narrow width with neon ink - please note that the neon ink on black is slightly translucent. Fluorescent inks glow under blacklight too. Nifty! 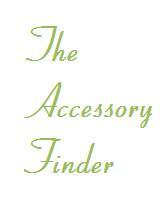 Welcome to "The Accessory Finder" blog. I am an artist and in the process of promoting my own work I've been exposed to and have worked with other artists that create amazing things. I am involved in artist networks and shopping websites that I'd like to share. I'm so enthralled by the talent out there that I've decided to create this blog to show off all of those perfect little finds that either make a room, make an outfit or things we just can't live without.